how motorcycles work.com knowledge is power. 5-valve head (continued) chamber may affect aerodynamic turbulence, thus affecting fuel/air mixture, thus affecting power produced. Also, cam timing (when the valves are opened and closed relative to the rotational position of the crankshaft and thus the position of the piston) greatly influences at which rpm a engine may make the most efficient power. The opening of the valves at an appropriate time at low rpm may causing choking of the air flow at high rpm. Or Helmholtz resonance, intake length size and length may produce a useful resonant pulse at a certain rpm while causing a reverse pulse wave at other rpm. Cam timing overlap (valve overlap), which is the period during the (usually oversimplifyingly-described) four-stroke cycle, where both the intake and exhaust valves are both open (of course, one is closing while the other is opening, and they are not at full lift at the same time) the escaping exhaust gases can actually pull intake air/fuel charge into the combustion chamber (this can actually pull intake air/fuel charge all the way into the exhaust headers and pipe - which is wasted, also a pollutant). The opposite effect can also occur: a returning positive wave of exhaust gas (possibly from the power-pulse of a neighbor cylinder, if an exhaust header is not correctly designed, or mis-matched to a head design) can push the intake air/fuel charge back up the intake runner and through the throttle body or carburetor. (This, among other resonant means, can cause double-carburetion) This can have a negative effect on cylinder filling, air/fuel ratio, turbulence, flame propagation, etc and thus affects power produced. Note: fuel injection is not affected by double-carburetion. Double-carburetion does not happen in fuel-injected engines because the injectors only pulse and spray fuel when the Engine Control Module (computer) sends an electrical signal to them to fire. Some factors affecting torque and horsepower: compression airflow resonance turbulence friction. There is, in fact, a multitude of conditions which affect the powercurve of an engine, and it takes teams of engineers and a wealth of historical technological data on internal combustion engine design and operation, and intensive and exhaustive tests and data-collection to continue to build more efficient and powerful engines in the confines of displacement limitation. Why Yamaha went to a 4-valve cylinder head is sure to be for good reason. Why Maserati experimented with 6-valve heads is a story and history unto itself. 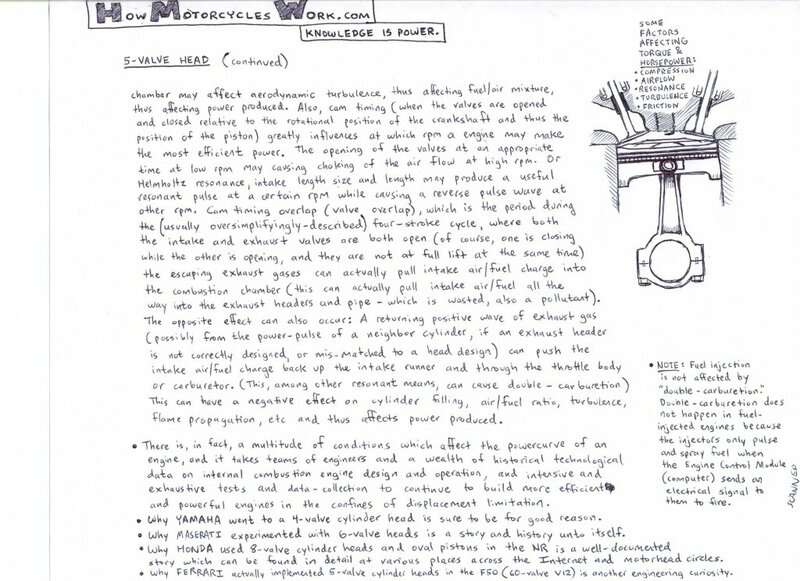 Why Honda used 8-valve cylinder heads and oval pistons in the NR is a well-documented story which can be found in detail at various places across the Internet and motorhead circles. Why Ferrari actually implemented 5-valve cylinder heads in the F50 (60-valve V12) is another engineering curiousity.